We’ve got our suspicions about why people don’t buy trikes, and they boil down to this: They’re just not real cars. In the modern era, three-wheelers have made a good showing as alternatives to motorcycles. If your heart wants to head out for Sturgis but your head says it’s pretty sure you don’t have the balance and endurance you had at age 21, there are trikes for that now. 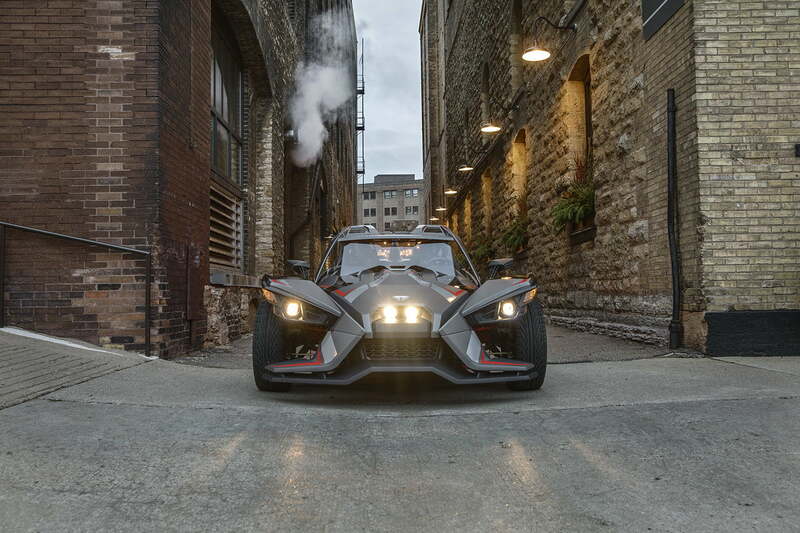 Three-wheeled motorcycles like the Polaris Slingshot, the Vanderhall, and the Can-Am Spyder now show up on beautiful country roads all over America. Motorcycle trikes are not cars. Not even close. You have to wear a helmet to ride one, and depending on what state you’re in, you might need a motorcycle rider’s license to operate your vehicle. To compete as a car, a vehicle has to work like a car, without any special skills required to operate it safely. A bunch of companies are trying to get off the ground with car-like three-wheelers, including Elio Motors, Arcimoto, and others. Each has its unique selling points, but let’s add another requirement to be a real car: You have to be able to stay dry inside. That leaves out the Arcimoto, which has open sides. If you live outside the sun belt, that’s not a year-round car. 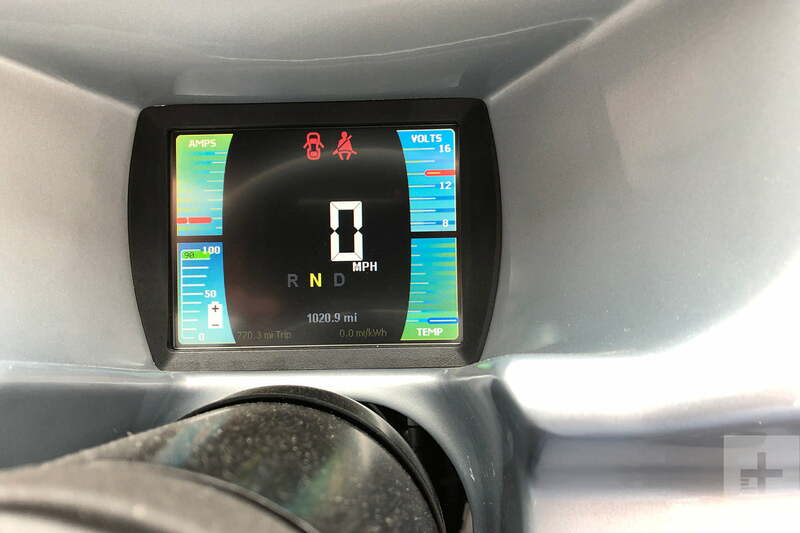 The Elio comes closer, but at the moment it’s designed to use a gasoline engine — a great selling point for sure, along with the $7,450 target price. But if you’re buying an entirely new kind of statement car, why not take advantage of the low weight and slippery aerodynamics of a three-wheeler and make it an EV? Well get ready: Two companies plan to do exactly that. Malcolm Bricklin is a legendary figure in the automotive industry. He’s the man who brought Subaru to North America, and he headed up his own eponymous car company in the mid-70s with a goal of producing a safer sports car. Now Bricklin’s back, with a new company called Visionary Vehicles and a new design he believes will disrupt the automotive industry — and finally get people into a three-wheeled EV. Bricklin’s two-passenger design is striking, with a futuristic sci-fi look and Lamborghini-style doors that scissor upwards. The old obsession with building a safe car is still foremost in Bricklin’s mind. Bricklin has an interesting plan to get his car built. Pricing has been announced at $25,980, and the company will limit production. Most of them are building three wheelers to keep it inexpensive because they don’t have to meet safety regulations. The company also plans to contract out much of the production work, but not in China. Bricklin has not yet shown his creation to the media or the public but he said that’s coming soon. Intermeccanica is an Italian company that is now based in Vancouver, Canada. The company is best known for its replica Porsche 356 Speedsters, but since 2012 it has been working on a three-wheeled EV as well as some plans for electric sports cars. Electra Meccanica spun off and went public in 2018 and trades on the NASDAQ exchange as SOLO. The Electra Meccanica SOLO follows the basic three-wheel format, with a single wheel at the back powered by an electric motor. Unlike the other options, the SOLO provides space for just one person. 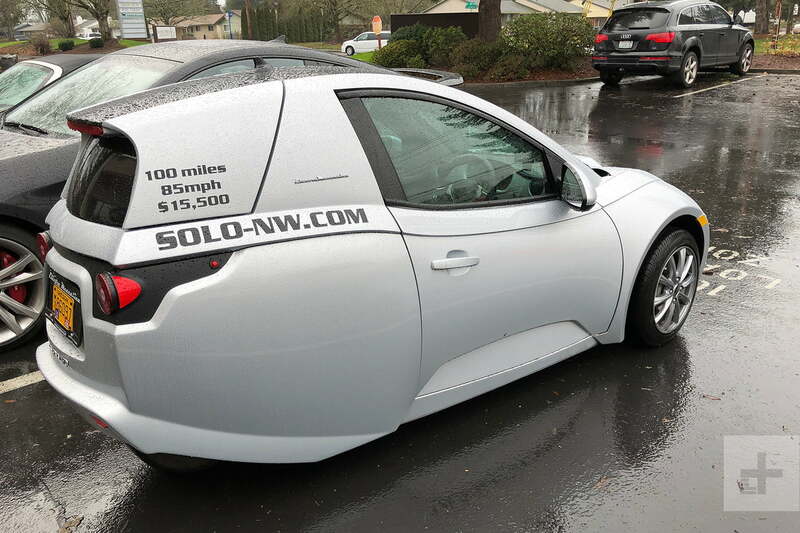 What makes the SOLO interesting is how much like a car it is when you get inside. 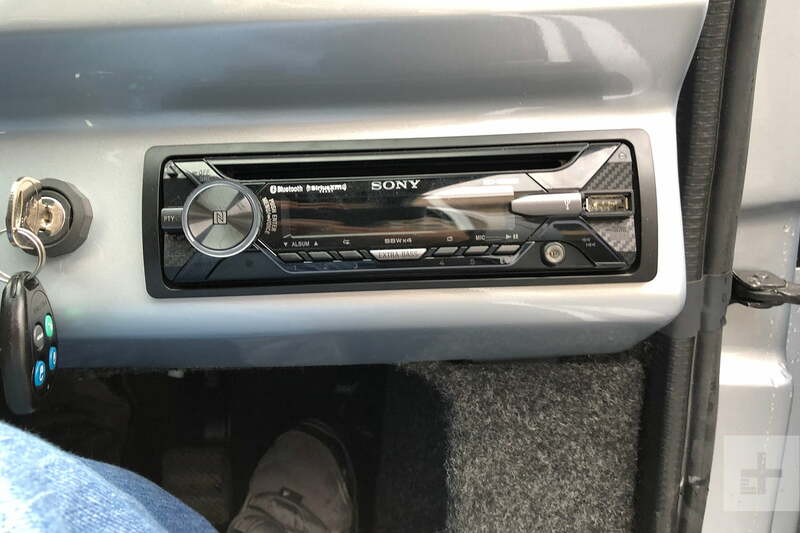 There’s a comfortable seat, a familiar stereo head unit, climate controls, and a nice digital dashboard. If you suffer from claustrophobia, it’s not going to please you, but it will keep you warm and dry. “Air conditioned, heated, power steering, power brakes, satellite radio. All the luxuries of a car in a one-person vehicle,” Kroll insisted. The SOLO is designed for commuters. There’s enough space under a hatch behind the driver’s head for a small carry-on bag or a big backpack, but that’s about it. There’s another storage space up front between the wheels, but it’s not big and if you get the optional air conditioning, it’s even smaller. Dominic Dobson is one of the first dealers for the SOLO, and he’s located in Portland, Oregon. 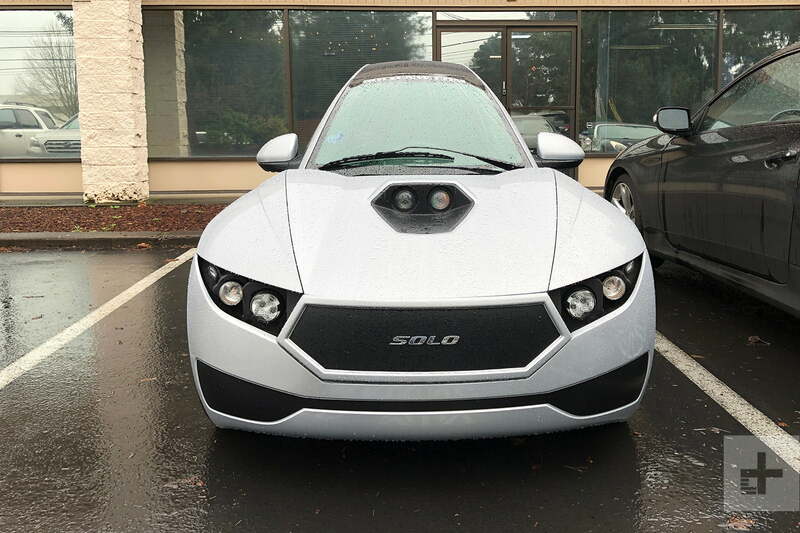 Electra Meccanica has produced several prototypes and is taking orders for the SOLO at $15,500 for the base car plus $750 for the optional air conditioning, which isn’t really optional yet. Kroll also said that the SOLO will be available on a lease. Perhaps the most impressive part of the SOLO experience is that you can instantly forget that you’re in a three-wheeler. Digital Trends took a brief drive in the SOLO while we were on-site, and the car lives up to its promises. It’s quick enough, but not anything like Tesla-fast. It’s close inside, but six-foot adults will have no problem getting in and out. There are doors on both sides, so you can choose the side with easier access. Once inside, the Solo uses a standard seat belt and requires no changes to your driving habits. Perhaps the most impressive part of the SOLO experience is that you can instantly forget that you’re in a three-wheeler. The car feels as stable as a four-wheel subcompact under normal street driving conditions. It’s not a sports car by any means, but neither is a four-wheel economy commuter like a Nissan Versa or a Chevrolet Spark. Both are priced to compete with the Solo. But will people buy them? Bricklin hit on safety as the main objection to lightweight three-wheeled EVs. Because most states still treat three-wheelers as motorcycles, these vehicles are not required to meet the same crash safety standards as four-wheeled passenger cars. Both Visionary Vehicles and Electra Meccanica are attempting to address those concerns, but it’s far from certain that an attractive price and green sales pitch will change consumers’ minds. Only time will tell if the era of the three-wheeled EV has arrived, but the current crop of contenders is certainly more credible than any that have gone before.